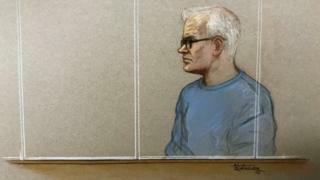 Burglars involved in the £14m Hatton Garden heist may have worn metal cloaks to dodge infrared sensors in an earlier raid at a jewellers, a court has heard. Michael Seed, 58, denies he was an alarm expert nicknamed "Basil" who played a key role in both raids. At his trial, jurors heard theories about how burglars broke into Chatila jewellers on Bond Street in 2010. An electrical engineer said they may have used special "cloaks" to gain entry undetected. Woolwich Crown Court heard one of the thieves might have posed as a BT engineer in order to tamper with Chatila's security system before the break-in. The burglars could have then cut the phone line to the alarm and used a 2G blocker to jam the mobile signal, jurors heard. Electrical engineer Gordon Herrald said in a report that movements detected by infrared sensors indicated someone had hidden in the alarm cupboard or under a table in the shop's viewing room for 26 hours. But giving evidence on Monday, he told jurors he did not think this was practical. "Another [theory] is they came through the wall, they got past the detectors, coming up the stairs, by cloaks - metal suits or whatever - then got to the alarm panel to do the work," he said. Brian Reader, 79, John Collins, 78, Daniel Jones, 63, Carl Wood, 61, and Terry Perkins - who died last year - have been convicted of conspiring to carry out the burglary in Hatton Garden. The probe into the heist revealed some of the same men had committed the "strikingly similar" burglary of the Chatila store, the court heard previously. Jones pleaded guilty to the Chatila burglary, while Perkins died in prison before he could be tried.